Did you know there is actually a Relaxation Day? There is! (Why it’s not every day, I’ll never know.) August 15th is the day set aside to focus on relaxing. A terrific way for anyone to relax is in your hot tub. There are just too many good things for your body and mind about sinking into hot bubbly water. The buoyancy relieves pain as well as muscle & joint tension. The hot water helps release endorphins to encourage mood improvement. The jets are like your own personal masseuse. The peace and quiet after you turn off the jets and soak in the silence can help your mind release the day’s cares. Or, you can play your favorite soothing music to help your mind focus on something you enjoy rather than the stress of the day. 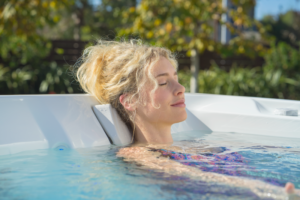 Taking the hot tub about an hour before heading to bed helps your body relax enough that you’ll fall in REM sleep much faster. Your likelihood of sleeping through the night also improves significantly. Getting outside help your reconnect with the world and realign your mind with your existence as part of something bigger. As I said, why relaxation day isn’t every day is beyond me. Maybe you should make a conscious decision this Relaxation Day to make it the start of your commitment to stress release and taking better care of you. Don’t you deserve it?